Download “sing me something”, an iPhone / Android app by which you can sing > record and share your voice among your facebook friends and they will predict / guess the song band and earn points. 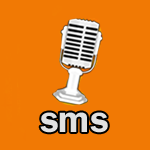 So it’s time to spread your lovely voice in between your friends or the whole world, just download “sing me something”, an iPhone app and be a singer, record and share your voice which single click among your facebook friends or the SMS app world. Actually SingMeSomething is a game like famous Picture guessing game in which one person draw a picture and the another one guesses its theme or structure but here in SMS we are using songs instead of pictures means one person will sing a song and another one will guess song band or other aspects. So if you are a bathroom singer who is waiting to sing in public then it’s a wonderful platform in which you can spread your voice to the world. You can also increase your music knowledge by guessing the songs sung by others so it is also a platform of learning while gaming. You guess the song band & other aspects and move to next level, for every correct answer you earn some points & knowledge and you can also share your score to facebook & challenge your friends to beat you by scoring more by guessing more. How Sing Me Something Works? What can you do as a Singer? What can an opponent / friend or music lover do? So in this way you can enjoy this music game. You can also invite and share your friends. This game records different statistics like Guessing time, total turns take for guessing, no. of coins earned etc. This app is available for both iPhone and Android devices you can download it free from APP Store or Android Market. See the above video to understand the features and functionalities of Sing Me Something App, see how can you enjoy and be happy after downloading this superior App on your iPhone or android device.